Today, 1byone is developing his business worldwide – to enhance the technology that connects us to the people, activities and experiences we love. We approach every detail from a user's perspective to improve our technology, raise the bar, and make life easier. That means starting with affordable, high-quality gear and ending with 100% user satisfaction — period. Our worry-free guarantee ensures you get quick and reliable service when you need it. Marvelous Effect - This laser light can cover a maximum area of 2100 square ft within a distance of 25 ft. Turn it on, the green Christmas trees and red dots will create a wonderful atmosphere for your parties. There are 10 different light modes, which can be altered by pressing the control button at the back of the unit. Moving, Flashing, or simply Stationary are available. User- Friendly - A bracket and a spike are included respectively for a hard indoor ground or a soft outdoor ground . Weather-Proof - The laser light has reached IP65 standard, which allows it to withstand snows, rains, dust or intense sunlight. So you can hide it among brushwood without worrying about its surroundings. Broad Application - This laser light can be used for Christmas, holidays, parties, balls, landscape decorations and many other occasions. A dreamland will be created wherever power supply is feasible! 1byone's Aluminium Alloy Outdoor Laser Christmas Lights with IR Wireless Remote is awesome to say the least! I love decorating the house for Christmas but when it comes to setting up the lights outside I'm just not really a fan. With 1byone's Aluminium Alloy Outdoor Laser Christmas Lights with IR Wireless Remote I can simply set up one light and have it shine on the house so my house looks festive for Christmas. I also really like that 1byone's Aluminium Alloy Outdoor Laser Christmas Lights comes with a remote so I can change things up whenever I feel the need to do so. With 10 different options, I'll never get bored! 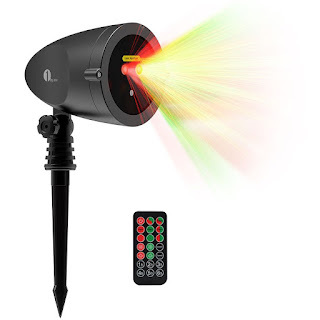 1byone's Aluminium Alloy Outdoor Laser Christmas Lights with IR Wireless Remote is incredibly easy to set up and will make any house ready for the holidays. The timer is fantastic for people like me who often forget to turn things off or don't want to go outside and unplug lights. 1byone's Aluminium Alloy Outdoor Laser Christmas Lights with IR Wireless Remote is absolutely incredible and I highly recommend it! Click HERE to learn more about 1byone! Follow 1byone on social media!